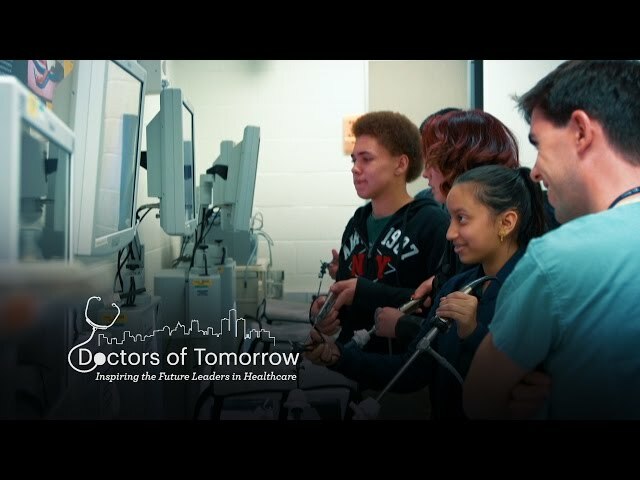 The Doctors of Tomorrow program inspires and prepares high school students from underrepresented communities to successfully pursue careers in healthcare in order to increase diversity among medical professionals. Through a longitudinal program of clinical immersion, academic preparation, and leadership development coupled with continued engagement and mentorship throughout high school and beyond, we strive to develop the necessary foundation for students to succeed academically and professionally. The program creates an educational experience where all participants are actively engaged in developing and promoting cultural awareness as we strive to reduce bias in the medical field and foster our students as agents of change in their communities. The goal of the Capstone Projects is to give students the opportunity to collaborate with peers and mentors, hone research skills, gain experience in public speaking, explore health topics more deeply, investigate how socioeconomic factors influence health and use creativity and problem-solving skills to begin thinking of solutions. In 2015, we began to partner with grassroot organizations in the Detroit community. The students and organizations worked together to create a Community Health Capstone Project. The original programming which pairs freshman high school students with first-year medical students to provide exposure to the medical field. Continuation of our longitudinal mentoring program for 10th-12th-grade alumnae with a specific focus on professional development and college readiness. Our newest mentoring program for Cass Tech Alumnae who have matriculated at the University of Michigan. To ensure continued quality improvement and dissemination of our program to other medical schools, we are committed to evaluating all aspects of the program. We are so grateful for the generous support of our donors who make the Doctors of Tomorrow Program possible! Applications are currently limited to only 9th graders at Cass Tech High School. They typically open in September! Ask Ms. Chillis for more information. Look for us during Second Look Weekend. If you miss us there, we will send an email to the entire M1 class during the first couple weeks of school. Last year we had over 80 medical students involved! As a student organization, we rely on your donations to keep the program running! Please consider donating today. The planning committee invites you to submit an abstract on primary research projects or innovative programs that address the need to increase diversity among health care providers.